I first heard this recording when I was 23 years old. It was during the worst time of my life! In short, I had returned home to Detroit, from a Fulbright Year in London, as a complete failure! The details, except for my terrifying depression, are utterly irrelevant to the theme of this article. What began to pull me out of that nightmare? For one, the unsurpassably combined genius of Miles Davis, George Coleman, Herbie Hancock, Tony Williams and Ron Carter. Some, like myself, consider this the greatest live concert album in all of jazz history. I knew when I first heard it! It was the creation of a far higher intelligence than I had ever contemplated before. Secondly, my father, a surgeon and a shamelessly self-declared expert on all music, whose lifelong disappointment in me had been most indelibly fulfilled during my profoundly embarrassing Fulbright year in England. My father HATED this album! Even more than the album, he hated Miles Davis!! He also hated everything Miles Davis loved! The John F. Kennedy family in particular! That, of course, made me fall INSTANTLY in love with Miles Davis and everyone else on this album. From that moment on, Miles Davis and this album in particular took me to church. Davis became a kind of religious figure and this album a kind of religious ritual. I’m now listening to All Blues. Ron Carter who was carrying the greatest load on this basically presto con possibile (tempo fast as possible) challenge?! It was about as fast a tempo as ANY bassist, who carries the unforgettably driving, indelible and indispensably most important figure of All Blues, as fast as any bassist could maintain. Later, after I’d had the divine privilege of having Ron Carter play in my trio, for far too short a time, I sent him a copy of an album I’d recorded after I had left America for Canada. On it, my trio performed Miles Davis’ own composition, All Blues. My tempo was hardly the, if you’ll excuse my saying so, BALL-BREAKING speed of the Miles Davis, Lincoln Center recording. Ron, even though my tempo was still slower than his Miles Davis version, he advised me that I must play that bass figure on the piano much slower than I had! The Wikipedia description of that Miles Davis concert quotes the critic Ian Carr as labeling All Blues as a major mistake on the album because of its excessively fast tempo. Other than that complaint, Mr. Carr gave the album, as he should, a rave. I disagree entirely with Mr. Carr about All Blues! Not only does Ron Carter and the drummer Tony Williams DRIVE the quintet into regions they perhaps had never been before! All Blues now brings tears of bliss to my eyes! The clear and separate tonguing’s of George Coleman on his saxophone?!?! Miles Davis’ brief return to end All Blues carries all the fire-filled energy of all the previous solos combined! That is only one reason Miles Davis is the LEADER of four other geniuses! Now comes the heart of not only the MEANING OF MILES DAVIS in my life, but his eternal place in my soul as the major lesson I needed at that terrible time in my life. While my know-it-all father was complaining about all the “clams”, jazz vernacular for all the mistakes in the Davis solos, I was in awe of not only the size of the Miles Davis vision but the courage it necessitated to reach out that far for something that had yet to be realized in the entire history of jazz. Yes, Miles Davis blew more “clams” in this one concert than most other professional musicians had collected in their entire career. I love every one of those clams!! Why? Miles Davis is on a hunting expedition! He will, indeed, find what he’s quite intensely, angrily and yes, insanely reaching out for!!!! Listen to his solo on Stella by Starlight!! The un-self-pitying agony and anger in it!! I was hearing a virtual recording of my own soul. Few human beings, even your own, closest friends, can deliver such a profoundly complicated form of comfort to your soul than Miles Davis has already offered to the entire world. Following that year in England, I was the loneliest young man on Earth. 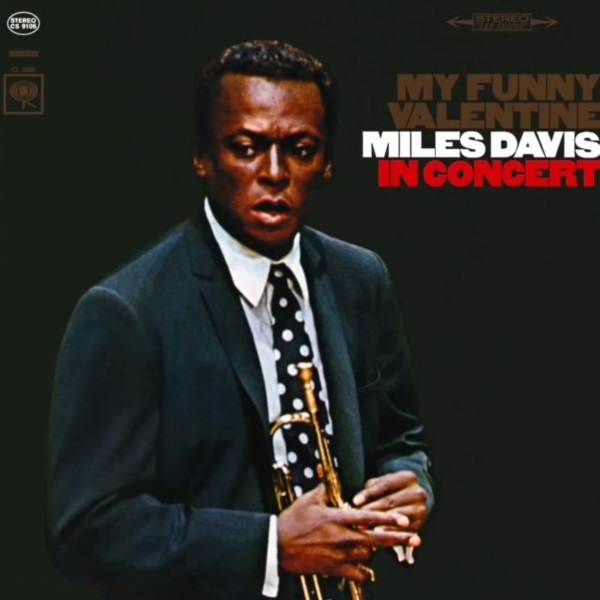 Only the divine sounds of the Miles Davis trumpet on his quintet’s Lincoln Center, My Funny Valentine Album, sounded as alone as I had become. Because of Miles Davis, I was no longer alone.